Hover to pause and click for more information. This body of work links to a time when a far deeper and relevant understanding of the forces of nature were within us all and has taken me to pre-historic sites across the country. A tangible sense of unexplained power resides in these places and they continue to provide me with a spiritual link to the land. A project that looks at the poetic beauty birds posses both in themselves and in relationship to each other and their habitat. It is envisaged that newly commissioned and already existing writing will be played against the photographs to produce a sensual experience highlighting the importance birds play in our modern world. A deep fascination and a personal need of places where sea meets land has inspired this work. The processes that create change and the resulting geomorphology has been central to my work for over twenty years. It has taken me all over the British Isles but is firmly rooted around Pembrokeshire and the Glamorgan Heritage Coast. A documentary project that started in 1980 and was added to in 1995 looking at life on a rural farming estate in North Wales. The work needs to be properly archived and I’ll be involving the local community in this. I ‘ll also be adding to the archive in 2013 documenting the changes the community has undergone since the 1980’s. 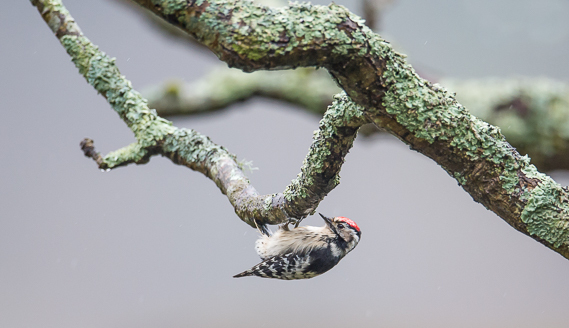 The Lesser Spotted Woodpecker is not an easy bird to see or photograph. I’ve been to quite a few locations over the years where they are known to breed (and it’s never easy to be 100% sure of that!) but never even caught sight of them. ‘A shy bird of the high canopy’ is often how bird books will describe them.